The finest soup recipes from the top chefs of today, from Rick Stein and Delia Smith to Giorgio Locatelli and Jamie Oliver. Few foods make us feel as good as soup. From the thick tomato soup of childhood to restorative spicy concoctions on chilly evenings, soup and well-being go hand in hand. Now this fantastic collection brings together 100 recipes from top food writers and chefs at work today. From Delia Smith’s Cauliflower Soup with Roquefort to Jamie Oliver’s Chickpea, Leek and Parmesan Soup, there are soups here for every need, whether quick post-work suppers or more sophisticated ideas to serve friends. 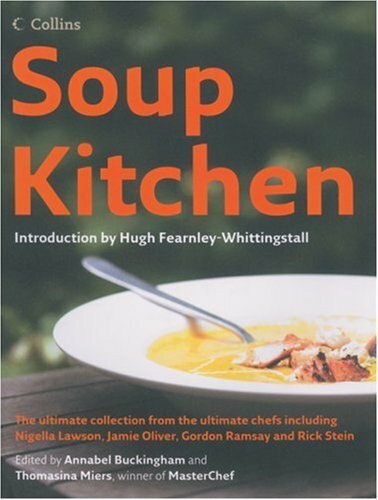 Headed up by Hugh Fearnley-Whittingstall, who introduces the book and gives his practical advice on stocks and key soup-making techniques, it takes a seasonal approach so you can get the best from fresh ingredients. Quirky, interesting photography and design make this a book with real personality, and royalties will go to homeless charities, including the Salvation Army and Centrepoint.